Michael Hallock is a poet and songwriter living in Pittsburgh. 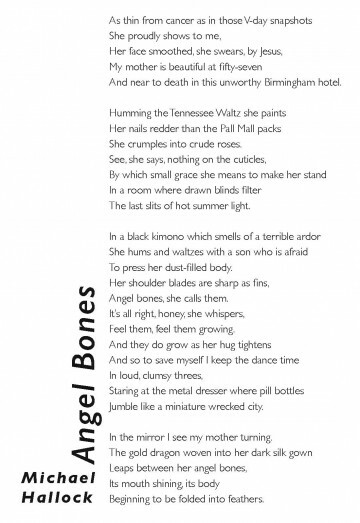 “I’m from the magnolia south,” he says, “as you may surmise from ‘Angel Bones’ – but I’m equally at home up north. New flowers to grow and there’s some undeniable connection between snow and contemplation.” Hallock has several folk-rock CDs to his credit, the latest being “Up A Winding Stair” with his band High On Loretta. “Songwriting has wonderful virtues,” he says, “but poetry offers no hiding place, entirely focuses the mind and spirit. It’s harder and scarier. I can’t say why but I relish that challenge. I love the freedom of modern poetry, though I think I use it in an old way – to tell stories – or at least to suggest them, rather than going for strange arrangements of words for their own sake.” Hallock’s poetry has also appeared recently in The Tower Journal, the Pittsburgh Post-Gazette, and is forthcoming in Angle Poetry. That dragon at the end of this poem is many things: the mother herself, indomitable, insisting on beauty even in an “unworthy” hotel; the disease that will kill her; and her son’s emotions which leave him barely able to count the beats of the waltz. What’s most dragon-like about this lady, though, is her complete lack of fear. Hallock’s portrait takes pains to show just how close to death, how “full of dust” she is but still, she insists she will be transformed. Here is the parent who rages against the dying of the light, who gives her disease no sway even as it consumes her. It’s tempting to think that such a death would be easier for the survivors to process and yet it doesn’t lessen her son’s struggle at all. Even as the dragon “folds itself into feathers” it keeps its teeth. This is a heavy poem full light imagery. The typefaces therefore had to convey how a person can be both present in the world but also leaving it. They also must be able to hold deep emotion without contributing any of their own. Gill Sans’ thin, even strokes leave most of the page white, a light footprint. The title and poet’s name are the anchors, a thicker version of the same typeface.